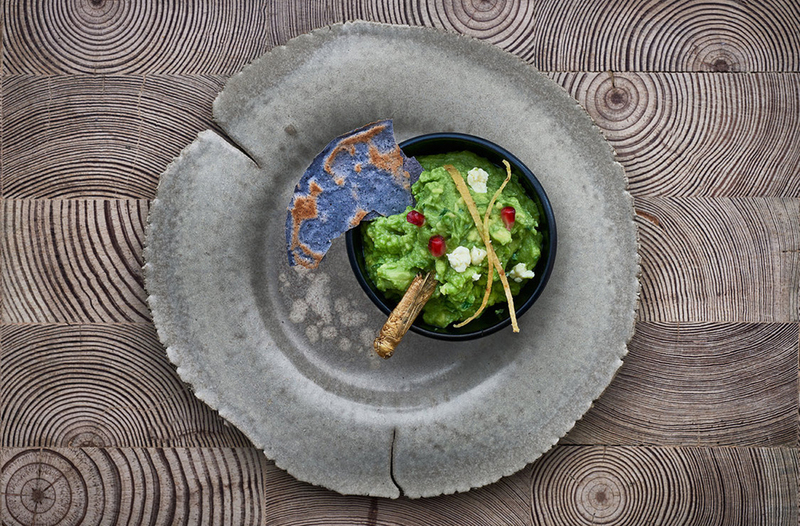 Glamorous culinary superstar Martha Ortiz is bringing authentic Mexican cuisine to a new level in London with Ella Canta. 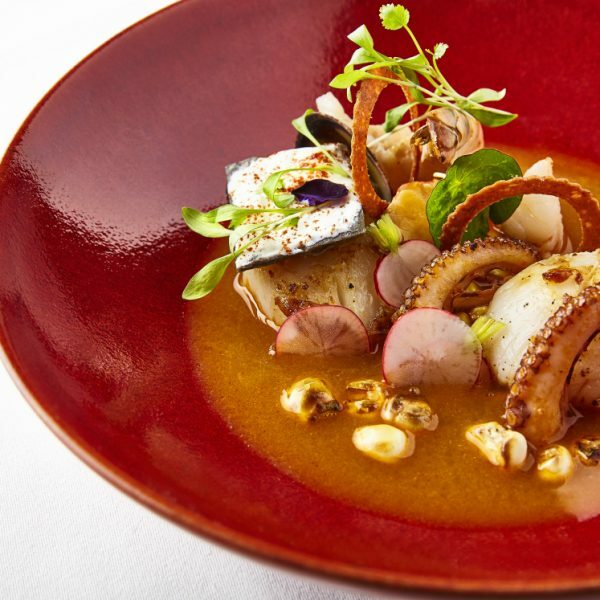 Ella Canta is a celebration of bold Mexican cuisine and freshly stirred cocktails. This wonderfully chic venue features soft, earthy tones paired with flickering candlelight, giving it a cosy, intimate feel. Martha Ortiz may not be a household name in the UK, but she’s one of the most recognisable chefs in Latin America. A celebrity in her native Mexico, she is a judge on television series Top Chef Mexico and has published multiple cookbooks exploring the country’s culinary history. 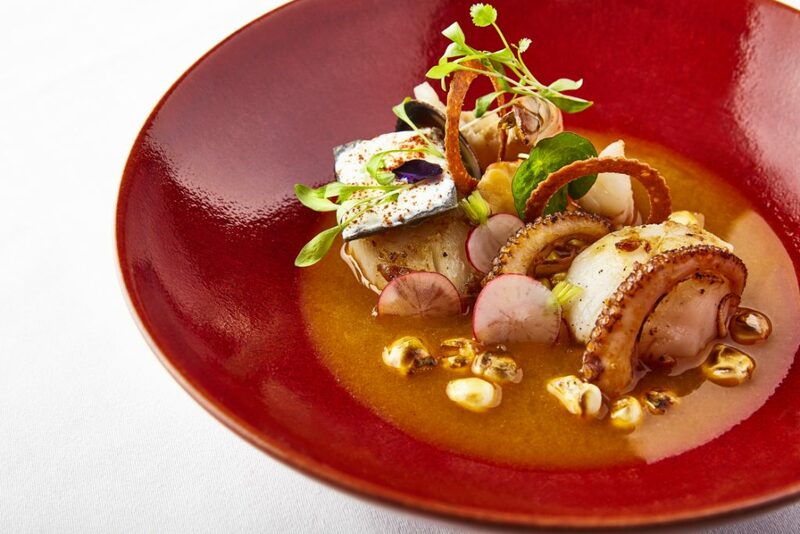 Vibrant colours and bold Mexican flavours feature on the Ella Canta menu, with dishes given striking presentation and attention to detail. Start off with signature guacamole served with ricotta cheese, pomegranate and a golden grasshopper –this starter was fresh, cheese was haloumi like in taste and texture and the black corn taco’s were tasty, crunchy and charcoaly in flavour (but in a good way). I had to stop eating the dish as I knew I wouldn’t fit the rest in! A creative cocktail list is served at Ella Canta, made with premium tequilas and eclectic infusions. There are also Mexican hot drinks, including coconut milk with chocolate metate from Oaxaca, mint and toasted pumpkin seeds. The food menu is billed as drama, main act, final curtain and its details are relayed as if the staff is telling you Mexican fables. It’s all bewitching and charming. I’m not sure if the Mayans mixed a mean Margarita, but there are four varieties on offer, all enormous and gorgeously garnished. 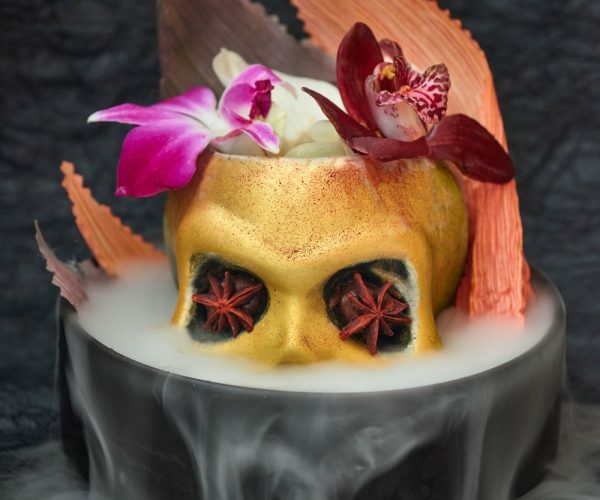 The Coa de Jima (tequila, rum liqueur, spiced pineapple puree, passion fruit and, because this is Mayfair, champagne foam topped with chia seeds) was surprisingly complex – rich, fruity but slightly spicy, and not sickly sweet. Elsewhere the cocktail menu champions mezcal and tequila, alongside obscure-sounding ingredients we were assured were loved by the Aztecs or Nahau people – such as tepache, made from fermented pineapple rind. This is served alongside vanilla-infused mezcal, Disaronno, Cocchi Barolo Chinato, lime and agave syrup in the sharp, bitterly sweet La Niña Fresa, named after a Mexican folk ditty about a spoilt girl who refused the drink. The menu is full of these nuggets of local lore and, combined with the Latin American soundtrack and heady drinks; it’s easy to slip into holiday mode! Then came the thrilling start to the food show: The Overture began with Tostadas: the menu has Selección de tostada crocantes which offers you a choice from fish to cheese; each had its own unique flavour and very fresh tasting. The Salmon was smokey, the Tuna was delicate and creamy and the cheese was very salty! We followed with the Drama which involved South coast sea bass ceviche, mango, sangrita sorbet which was sweet, wholesome and had a hint of delicate spice. The sea bass was meaty and fresh and a very good portion. We also tried Octopus, guajillo oil, charred onion, this was very moorish, crunchy and deep fried, the sauce was warm but not spicy. Sometimes octopus can be slimy, this was not the case at Ella Canta it was not over cooked it was perfection. Then the Main Act started with Lobster which was juicy, cooked al dente, it had a bite to it! The pineapple on the side was baked and raw and added a summer feel to the dish, you could just imagine sitting by the ocean sipping on a Margarita and eating this dish. 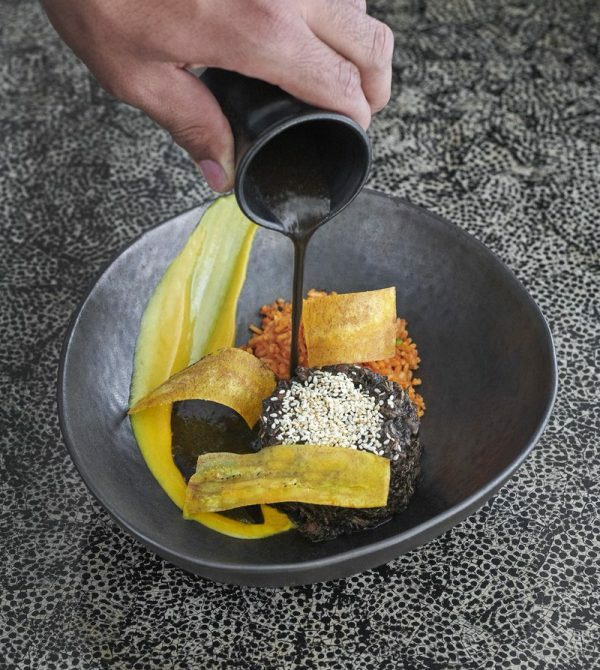 The Duck with black mole, plantain purée and red rice was spectacular; the mole takes 2-3 weeks to make. The dish was full of flavour with the taste buds being given a whole new taste sensation. We paired this with a choice from Munzio our waiter: Chayote salad, cucumber and lime: it taste sort of like a jicama: mildly sweet, incredibly crisp and juicy, somewhere between a potato and an apple, or a crisp pear. But unlike the jicama, which is tan on the outside and pale white on the inside, the chayote has a distinct green-ness to it. It was a very interesting and refreshing addition the Main Act. And the Final Curtain – dessert with Churros, a typical Mexican food which is sweet tasting and very filling! Chocolate Cake which was a molten pudding oozing out goodness! Milk Cake, which I had never heard of, was a very light sponge with fresh strawberries and edible flowers and ice cream. All desserts were flavoursome and presented beautifully – this is something Ella Canta does very well, a perfect restaurant for your Instagram posts and your taste buds! With the Final Curtain I would definitely recommend you be like a Mexican and share as the portion size is very decent and if you want to enjoy the full show with an interval I would think about sharing a dessert on my next visit! Martha Ortiz is known for her edgy take on chef jackets. Her sense of style has been extended to the staff at Ella Canta, who dazzle in vibrant tailored dresses and sharp suits. The women all wear exquisite paper flowers in their hair; a stylist was brought in specially to teach them how! Their earrings from Mexico are equally dazzling. 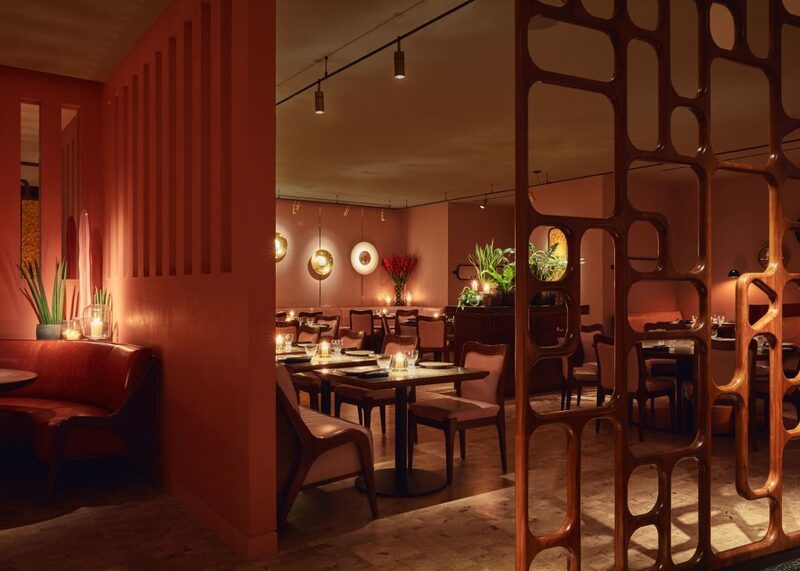 Interior designers David Collins Studio bring the heat and colour of Mexico to life, paying homage to Modernist artists and designers. The dining space is separated into sun-blanched blush pink, red, tan and blue spaces separated by an extravagant floor to ceiling walnut installation, table tops are finished in handcrafted eggshell-like lacquer, handmade wallpaper glints with gold. It does suspend belief that, despite the separate entrance, we’re in a restaurant that is part of the Intercontinental Hotel, just. Make sure you take it all in with beautiful artwork and even stunning toilets! 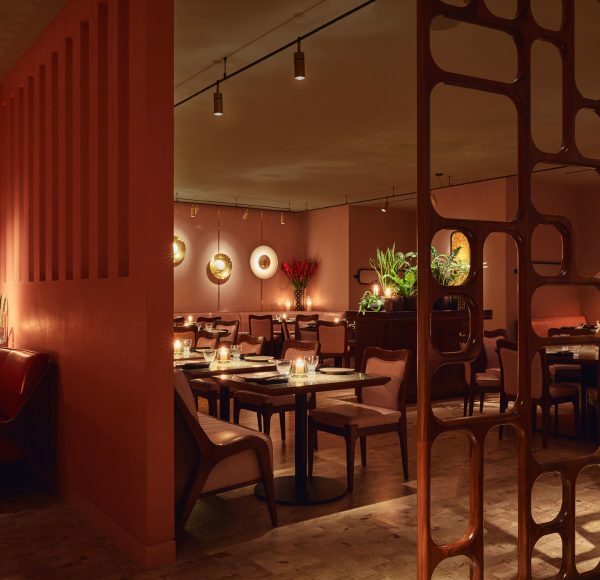 Everything sang to us during our time at Ella Canta and the staff make the experience with their knowledge and expert advice, go and get a real taste of Mexican fine dining in London- it’s a treat for the senses from start to finish.